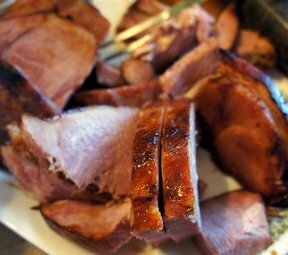 A no-fuss way to prepare your holiday ham. Easy to prepare and sweet and juicy to eat. You'll have extra time to visit with your guests while the glaze does all the work. Preheat oven to 300°. 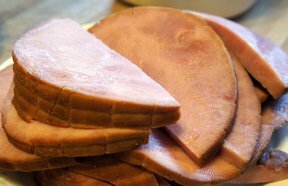 Trim skin and excess fat from ham and place in pan. Score with a sharp knife, making a crosshatch design over it. Roast for 2 hours. Make glaze by combining marmalade, mustard, sugar, and clove. At the 2 hour mark, remove ham from oven and brush the entire surface with glaze. Increase oven temperature to 350 and return ham to oven. Cook another 1 1/2 hours, brushing with more glaze at least 3 times. 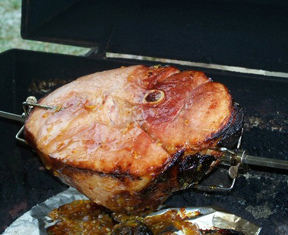 Allow ham to rest for about 30 minutes before carving. 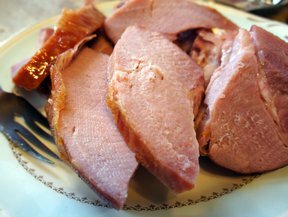 "This ham recipe was great! The ham was so moist and tasty. The glaze was a perfect addition. I cut back on the cloves a little because I don't like too strong of a clove flavor. Everyone commented on how good the ham was. I will use this recipe again."